The change to a colder air mass after the front begins to clear early Wed introducing a more unstable airmass with the passage of upper troughs aiding convection with the possibility of wintry showers on elevated ground and hail and thunder more so in Atlantic Coastal counties. Getting much colder as the day goes on. Last edited by SleetAndSnow; 13-01-2019 at 22:20. Colder air arriving behind the cold front, heavy showers with hail and sporadic thunder tomorrow , wintry on higher ground possible. Rainbelts advancing into the cold air mass early Fri morning and looks like producing some snow if somewhat wet and sleety perhaps . Looks like getting up to around 6c in general.Will get a better picture closer to the time. Looking windy on coast and quite breezy overland giving a substantial windchill. ECM showing some snowfall for Fri, will be interesting to see if any sticks, probably some on hills / mountaians for a time. 18Z HIRLAM (short range) calling for some light snow showers/flurries in places on Thursday morning. It's even better than GFS for the same time range in terms of reaching all levels. Just very little precip around. Will be very interesting to see what it throws up for Friday this time tomorrow. Only 48hr range on this model. Euro 4 ,AROME and ICON showing it to be gusty tomorrow and possibly squally at times especially in the SW and W. Could be some big downdrafts out of those big clouds. HIRLAM still going for a possibility of very light flurries later tonight into tomorrow. Now followed by more significant "snow" for the west and midlands on Thursday night, but followed immediately by sleet and rain, under -6 and warming uppers. Hard to see anything sticking with both Temp and DP likely to be above zero. Probably safe to say that mountains over 400m or so will look pretty good by Friday though. Last edited by sdanseo; 16-01-2019 at 23:19. 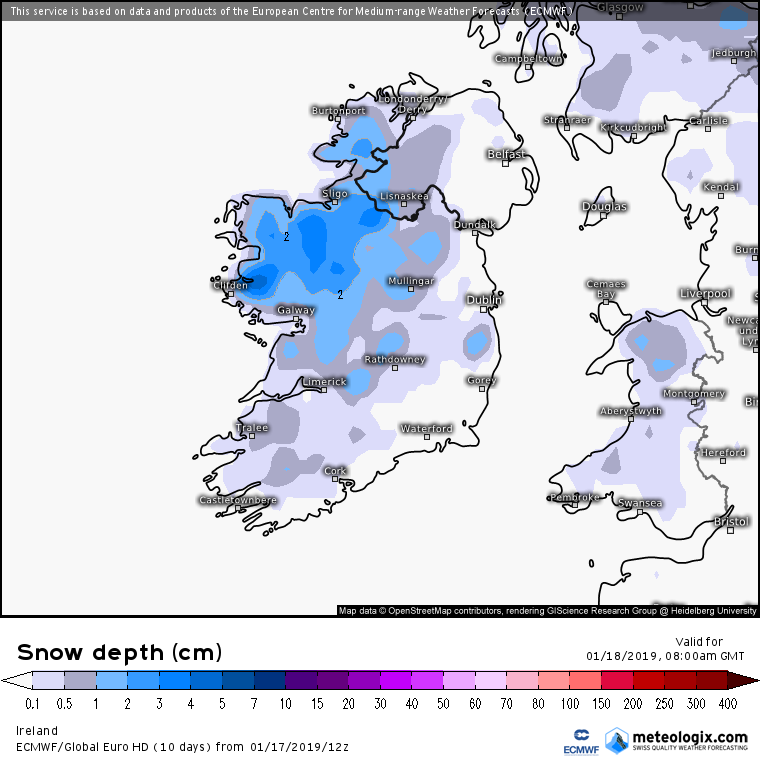 All Irish airports except Cork and Waterford are forecasting various combinations or probabilities of sleet overnight. 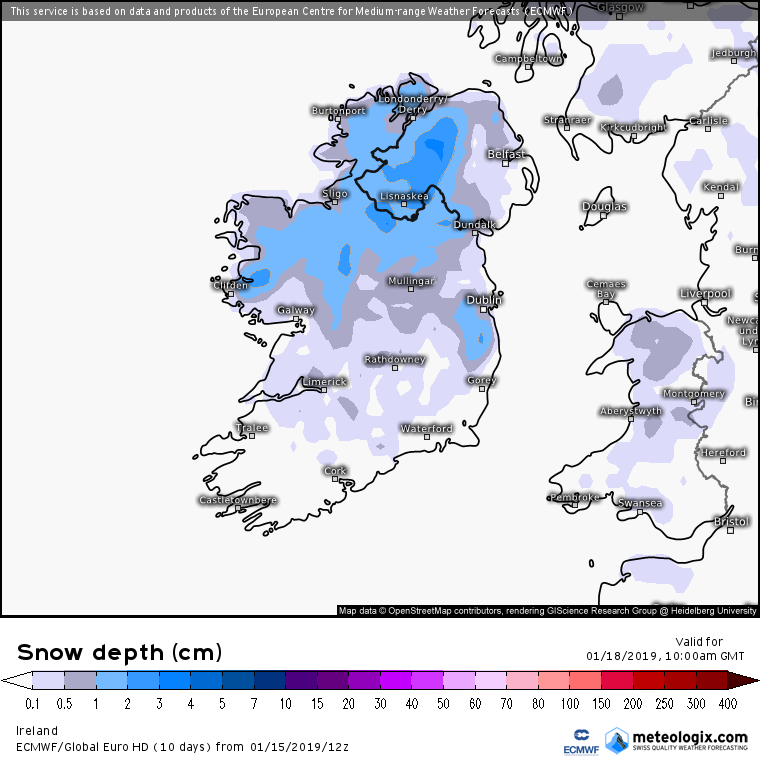 High ground will see snow almost certainly, northwest of a line roughly from Limerick to Dublin to Derry. Last edited by sdanseo; 17-01-2019 at 21:26. The WRF quite representative of the other models giving the first true taste of winter overnight and into the morning this year. Wouldn't be surprised to see reports of some lieing snow on hilly locations in the W and NW early tomorrow. Windy as the front crosses the country in the early hours. Plenty of mountains covered in snow tomorrow morning I would reckon. Good chance to see the accuracy of the model predictions. Icon is starting to show a difference towards colder on the 12z run with the high not as far east at 114h, which really means nothing but interesting. Still no confirmation on anything though because the models are all over the place. The next hunt for cold coming into range. A northerly for next weekend. 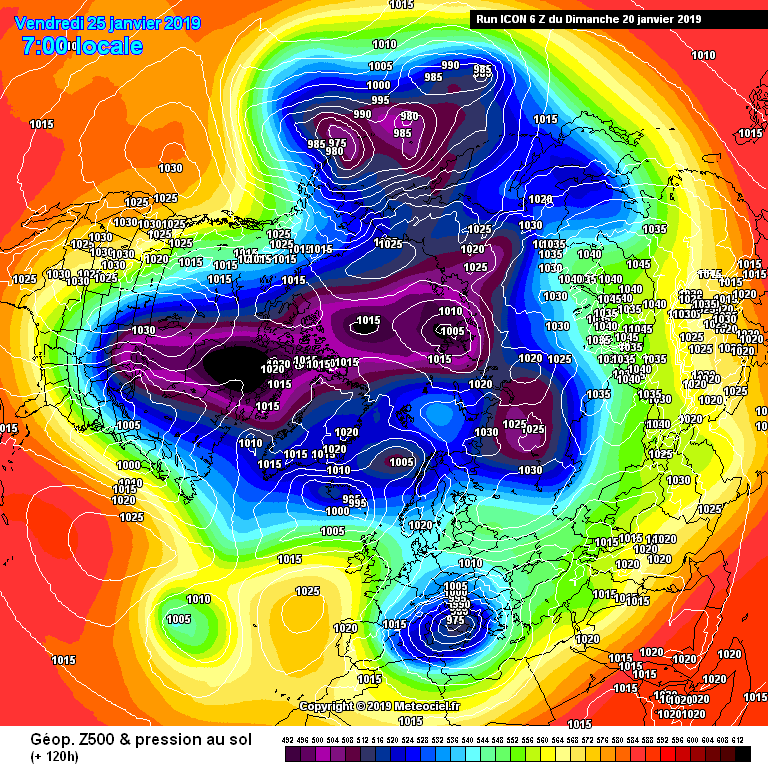 Ecm and gfs also have one but not till Sunday. Perhaps the models will firm up on this during the week. Area of LP set to track over Ireland this weekend and later to merge with another area of LP . 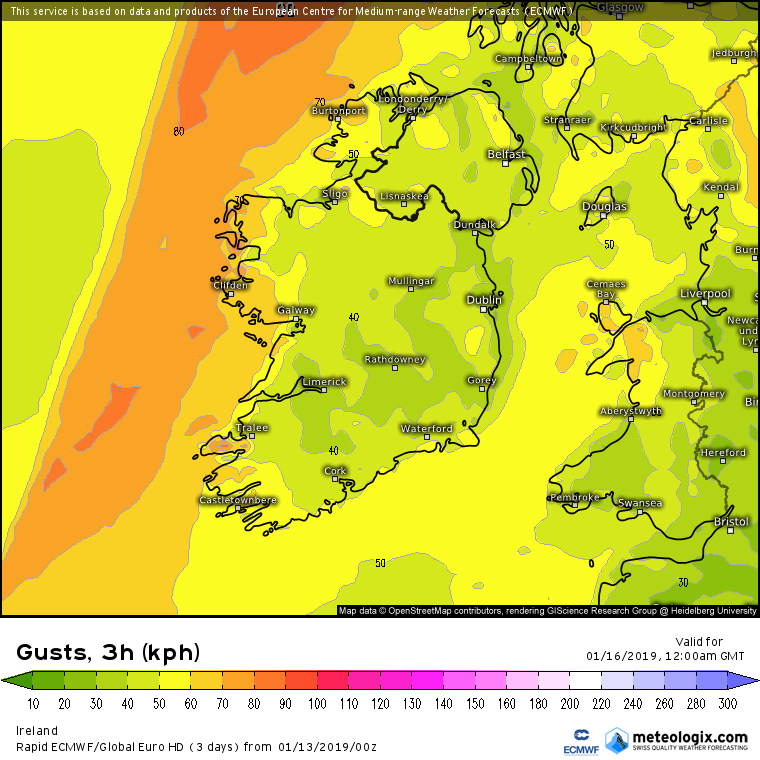 Set to get very windy through Sat and quite wet under the passage of a cold front . 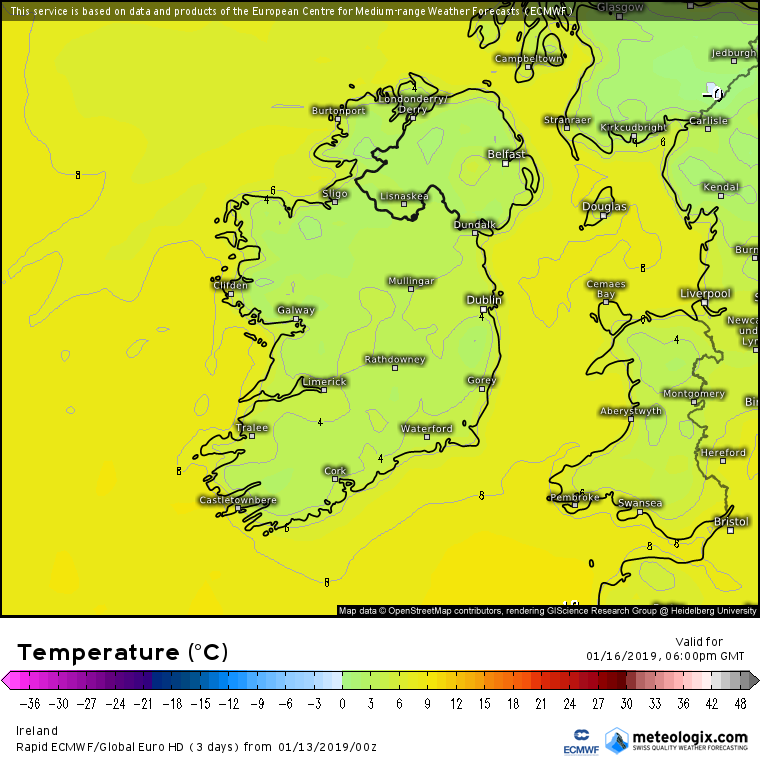 To go from relatively mild temps early Sat to very cold by night as winds switch to a NW'ly direction dragging down Polar airs over the country in a blustery airflow feeding in wintry showers with hail and thunder possible by evening. Winds will need to be monitored with a deepening low like this . Rough looking day Saturday. This low has come from nowhere yes?